We use fully trained Cavitation Specialists to perform all Body Modification treatments. The standard process involves combining an Ultrasonic Lipo treatment followed by a scientifically formulated Body Sculpt Wrap. State of the art Ultrasonic Cavitation Machinery is used to contour various areas of the body. Our specialized technicians skillfully break down layers of fat and toxins, followed by manual tightening the skin. 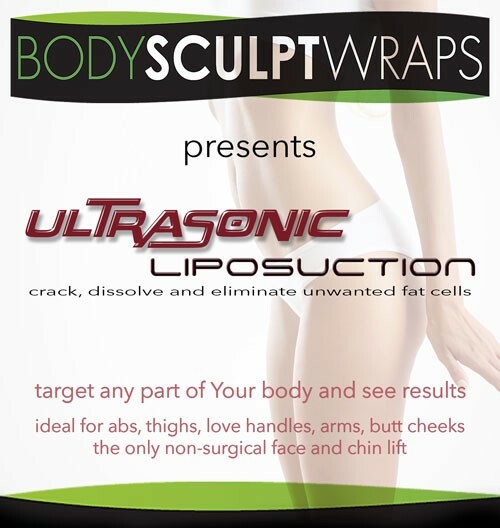 Specially formulated Body Sculpt Wraps are then applied to draw out the broken down, dissolved fat and toxins from the body and help continued toxin drainage. Many people ask us how long lasting will the results be? The response is that to sustain anything good, one has to continue to be conscientious in one’s efforts! May clients witness immediate results in weight, inch loss and contouring, inspiring and motivating them to continue down the path of achieving their best possible condition. To help achieve additional success, a well rounded dietary and precision-based fitness program, which incorporates modified nutritional implementation with a healthy fitness regime, is offered to all clients. Body Sculpt Wraps has designed a fully comprehensive program that not only promotes health, wellness and beauty but advocates a lifestyle change.